Murder Comes by Mail by A. H. Gabhart, a Mysterious Review. Review: Always willing to help where needed, Deputy Sheriff Michael Keane was, however. less than enthusiastic about bussing a group of the Baptist senior citizens to a stage play staring the niece of one of the ladies in the flock. As he was about to drive over the Eagle River Bridge, he sees a man on the edge, in the middle of the bridge, looking like he was about to jump. He stops the bus and runs towards the man, who really wanted to jump. At the moment the man let go of the railing, Michael catches him and swings him over to safety. The man tells Michael, "You will wish you had pushed me. ", in Murder Comes by Mail, the second mystery in this series by A. H. Gabhart. Some of ladies, with their cameras, caught the heroic deed as it happened. The story made the local paper and Michael was embarrassed at being called the city's hero. Like most police, he said that "he was just doing his job". The interest in that story didn't last long as a report of murder hits the headlines. Photos of a young dead girl had arrived in the mail with a note in bold black print saying, "I told you you'd be sorry!" Michael believes this was in direct connection to the man whose life he saved. Then more bodies are found and more pictures arrive in the mail. The killer always seems to be a few steps ahead of Michael. He has to find out who the killer is and the reason for the killings. The madman's messages are hitting closer to his loved ones. Murder Comes by Mail is a suspenseful mystery and one made more enjoyable to read without use of bloodthirsty details and grisly language. There are, instead, a wonderfully eccentric collection of characters that Deputy Sheriff Michael Keane must contend with, including his own Aunt Lindy. On a personal level, Michael Keane is in love with his childhood sweetheart, an attorney in Washington D.C., quite a drive from his home in small-town Kentucky. With a strong plot that moves right along, this is a clean, fast read and a most enjoyable novel. 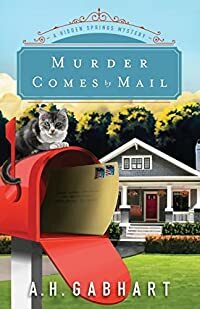 Special thanks to guest reviewer Betty of The Betz Review for contributing her review of Murder Comes by Mail. Acknowledgment: Revell provided a copy of Murder Comes by Mail for this review.